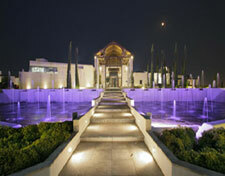 Hotel Nikopolis Thessaloniki is a 5 star Boutique City Resort, built in an area of 25.000 sqm. The Hotel is situated 3 km from �Makedonia� airport and 20 minutes from Thessaloniki�s city center. It�s location, at the heart of a wide and continuously growing district of commercial activity, positions the Hotel as a destination for the business travelers. The high quality and flawless service, the spacious and modern decorated areas and it�s unique architecture features, have gained the appreciation and trust of the demanding travelers who visit the city. The modern design of 99 luxurious rooms and suites, decorated with unique pieces of furnitures and lights that carry the signature of the most well-known contemporary designers of the world. There are various room types which can satisfy the needs of every traveler: 67 Superior rooms 32 sqm 25 Deluxe rooms 40 sqm 4 Junior suites 46 sqm 2 Executive suites with 1 room 70 sqm 1 Presidential suite with 1 room 78 sqm Non-smoking rooms on a seperate floor and rooms for people with special needs (handicapped) are available. All rooms offer spectacular view at the pool or at the gardens, marble bathroom with separate shower and bathtub, LCD Flat Screen TV with satellite connection and Pay TV, individually controlled air-conditioning, soundproof windows, wireless and cable connection to the Internet, personal electronic safe box and mini bar. Hotel Nikopolis Thessaloniki accommodates high level professional business meetings, conferences, seminars and social events for up to 1.100 people. The astonishing rooms, THE ATRIUM and THE BALLROOM are unique for the stylish design, the luxurious decoration, the excellent infrastructure, the exquisite menus and the flawless service. The contemporary architecture of the glass surrounded room THE ATRIUM (465 sqm) with the natural light and the view to the impressive outdoor pool and the gardens, make the perfect room for business meetings, private parties and wedding receptions up to 650 persons. The BALLROOM (415 sqm) which is an absolutely modern conference room can accommodate up to 350 persons. The view to the outdoor pool waterfall, the design and the decoration proposals, have established the room as one of the most hospitable places in town. In addition, the meetings rooms Alpha (100 sqm), Omega (100 sqm) and Kappa (40 sqm) all with natural light, can serve the needs of meetings, demonstrations and seminars. The audiovisual equipment can be tailor made according to the needs of any event. The Da Vinci Italian restaurant of Hotel Nikopolis Thessaloniki, has 120 seats and offers authentic Italian flavors and a great variety of local and international wines. It operates for breakfast, lunch, dinner and Sunday brunch. The Galaxy Bar and the BarCode constitute a fresh entertaining proposal with exceptional music and outstanding service. Further more, the Blue Bar is the meeting point during the summer months located next to the extraordinary big outdoor pool. For your relaxation and rejuvenation you can visit the unique Aqua Club Spa, which offers personalized health and fitness services in contemporary and luxurious surroundings It provides state of the art fitness center, indoor heated pool, Spa facilities which include sauna, steam bath, jacuzzi, cold shower (shock), solarium, spacious personal lockers and outdoor pool of 1.700 sqm. Choose from a variety of face and body treatments and massages for men and women, with natural products of Elemis, one of the most famous companies in the world specialized in body and facial treatments. For funs of tennis the hotel offers two high-end clay courts available throughout the day.